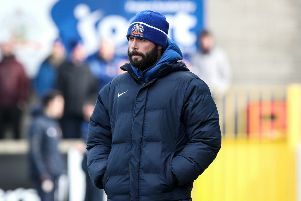 Glenavon player boss Gary Hamilton has lost his appeal in relation to his sending off against Dungannon Swifts on September 17th and will now be banned for six games. The Lurgan Blues launched an appeal after Hamilton was sent off by referee Mervyn Smyth following an incident between himself and Chris Hegarty at Stangmore Park. Hamilton was handed a two-match ban for violent conduct and a further four-game ban, with two games suspended, for his post match comments. But the IFA Appeals Committee confirmed on Friday Hamilton’s appeal had been dismissed. They concluded the Glenavon manager’s comments about referee Mervyn Smyth ‘amount to a deplorable lack of respect for a referee’. The Appeals Committee is also satisfied that there is no ‘animus’ against Mr Hamilton from referee Smyth. The ban will start from Monday 5th December.